Addmen Group : OMR Blog, News & Tips - Here, you'll find tips, news, and best practices pertaining to the OMR software. Addmen provides School Management Software with all features including CCE pattern for CBSE Schools. Following are few of the basis features of this software. Detailed classification of admission enquires on basis of course, city, area, type of admission, publicity source etc. can be obtained. Past communication details and future follow-up schedules can be maintained. Periodic graphical business/ counselor analysis. 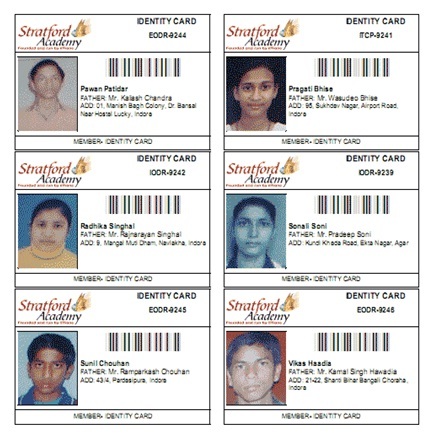 Quick registration based on user-defined fields with user-defined roll no pattern, generation of instant Photo & Barcoded ID Card; Elaborate and efficient search of group/individual based on parameters like name, surname, ID, father’s name, address and many other filters based on any user defined field; photographs and signatures of student, parents & local guardian, captured through scanning or directly from webcam; every communication through verbal mode or phone is maintained in individual student log book can be recorded. Emails or SMS sent are automatically recorded. Records of prior degrees, institutes, exams appeared and marks obtained; details of parents, occupation, income, assets and other social data are managed. This maintains records of details of siblings, birth and domicile information, records of seminars, workshops guest lectures and campus interviews attended by candidate and the results and details of companies & employers; biodata of candidates, their height, weight and record of disease/disorders, record of reacting drugs and any medical instructions for quick reference; Records of activities in which student participated, result, comments and prizes won. Documents & certificates submitted or pending for submission and those issued to students is also maintained. Admission process is the all-embracing task for all the educational foundations like schools, colleges, universities or tuition classes. Addmengroup provides the student admission management software with the help of this software we can manage all the activities related to the admission process such as to check the admission forms, to collect the fees, making fee receipts and to transfer the information of that particular student into the organization’s database. This software saves the time and manpower too. 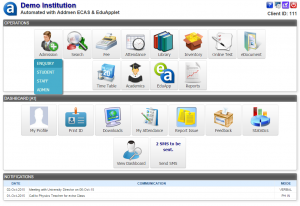 Let’s see how student admission management software which is integrated in the ECAS helps to all educational foundations. 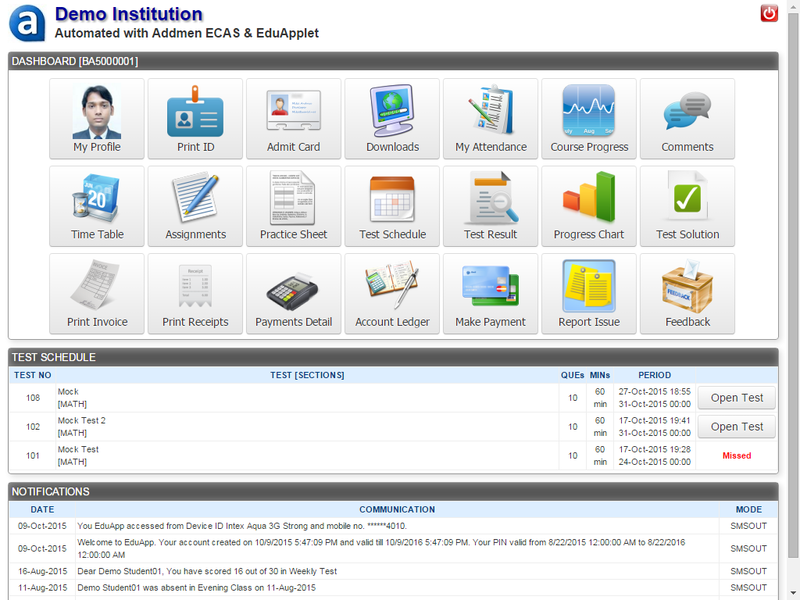 Enhanced Campus Automation Software has the Admission module in that module there will be the enquiry section. Organization’s Workforce member and the counselors can enter the detailed information of student. With the help of Admission module one can keep a track of the follow up done by the staff members. A separate web interface is provided within that module, so that students can be able to enquire about any queries related to the course. This module keeps the enquiry communication record. With the help of that record user will come to know about the status of each student’s admission process. As this software keeps the records of enquiries and follow-ups, we can search for these records by making the use of filters. We can restrict the access to this module of the software. So that only staff members allowed to access can work in the admission section. If student wants to begin the admission process then, the user would be taken to an online admission form. User has to fill the required fields of information exactly. If the students information is found in the enquiry section then, that students can openly bought to the admission section. The information fields in this form can be adjusted effectively. It is conceivable to include fundamental fields, change the names of existing fields and in addition erase those that are not required. We can add the different types of fields like selectable, compulsory, direct entry, numeric/text etc. Also the webcam is provided to upload or capture the photos and signature of student, his/her father, mother and guardian. This software can store the basic details of the student; also it can store his other details like academics, hostel, family, alumni, languages etc. The student admission management software is flexible and valuable to a certain extent. 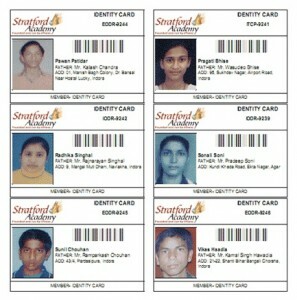 It eases the admission procedure and makes possible to have the details of all the student at one place. On the off chance that your foundation has a few branches, you can get to the enquiry and admission records of all the branches from a solitary area. OMR is the Optical Mark Recognition software which is used for the purpose of reading OMR sheets, i.e. sheets that are containing blocks or bubbles. Addmengroup provide such useful software with different modules integrated in it. One of the modules is OMR Form Reader software. The OMR Form Reader software is utilized for reading OMR sheets. 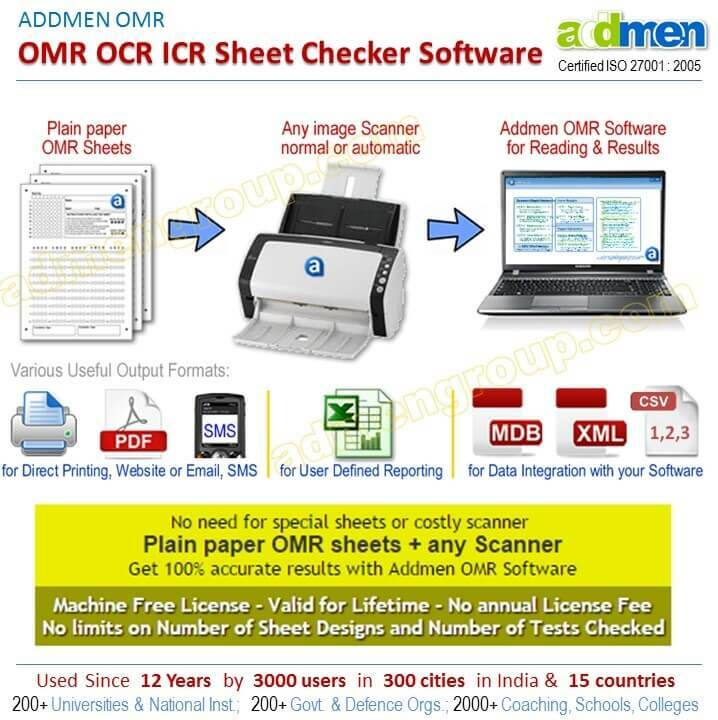 At first the sheet gets scanned by the OMR software and then OMR reader software reader software collects the information and sends it to the Excel sheet. So the main use of this software is to gather the information from OMR forms. This is the best software in order to read and gather the information from the different forms like survey sheet, questionnaire, application form and admission form. This software not only transfers the data to Excel sheet but also to the other mediums like Access, XML, SQL and CSV etc. Also the OMR form Reader software has OMR sheet designing software integrated in it. With the help of this software we can design the various OMR forms. As this software has the Optical Character Recognition and Intelligent Character Recognition technology it is possible to read the printed numbers, barcode and copy the handwritten text respectively. The OMR Form Reader able to read the images and save them into the database along with names. Use this OMR Form Reader software with 100% accuracy and check all the OMR forms automatically without any errors. Addmen group offer examination management software those are having multiple feature like question paper generation, question paper checking. It can handle different exam related activity. Question paper generator software is one of the best software. In this software there is bunch of questions out of this at time of exam it will drive one by one question to the user the student who appear for this exam. Addmen group present QPG question paper generator software features components in the business sector these are basically useful for the new client the individuals who have not seen this sort of software. The questions are selected randomly from the question bank stored in the software. You can modify the question sequence as per the requirement. The questions can be sorted according to marks allotted to each question. Many sets of question paper can be created by using the Question paper generator software. Generate question bank using question bank generator software. The Addmen question paper generator software is a reliable system that is used by several educational organizations to generate question papers. It is quite easy to run, and you can create question papers within minutes. However, before you create the question paper, you require creating a question bank from which the software extracts the questions. Hence, you need to learn how to generate the question bank first. The process of creating a question bank is very simple. The best part is that you do not need to have the software during this step. All you need is a laptop or computer and a Word document. Different types of questions can be stored in the question bank starting from subjective questions to multiple choice questions. In case you want to create a question bank with MCQ based questions; you have to first create eight columns. The first column should have the serial number, the second should have the question and the next four or five columns should have the answer options. The last column should have the right answer. These word documents are stored in files which are called Question Resource files. You can create as many QR files as you need. Also there is no limit to the number of questions that you can store in one QR file. However, it is advised to create topic wise QR files as small number of questions would make it easy for the operator to open and edit them. Once the QR files are created, you have to categorize the questions so that it becomes easy for the software to select questions while generating the test papers. You can classify the questions according to subject/unit, category/class, difficulty level, reference, etc. With the question bank ready, you can use it whenever you want to set a question paper. You do not need to delete existing questions to add new ones. There is no limit to the number of questions you can add into the question bank. The OMR or Optical Mark Recognition reader can recognize dark marks on an OMR sheet. This sheet is not quite the same as an ordinary bit of paper as it contains index points on its four corners. These file focuses cause the OMR reader to identify the dark marks on the bubbles. While most OMR software can’t read handwritten content and pictures, those that have OCR and ICR are able to do as such. OCR is Optical Character Recognition and ICR is Intelligent Character Recognition. The nearness of these readers has a few favorable benefits. With the OCR it is conceivable to read printed digits, while the ICR is utilized to read written by hand digits. Some OMR sheets like admission or other information accumulation forms have a space where individuals need to give data in writing. This incorporates name, address, course points of interest, and so forth. As writing these subtle elements may prompt blunders, most schools and universities incline toward utilizing the OCR and ICR readers. Aside from manually written content, admission forms additionally require the understudies to stick their photo in the space gave. With the ICR reader, the photo is caught and embedded in the database. Some OMR answer sheets have barcode on them. With the OCR and ICR readers it is conceivable to read barcodes on a wide range of coding formats. Any consistent scanner can be utilized to read the OMR sheets. When you scan the sheet, the OMR, ICR and OCR software would do the processing and convey the fundamental outcomes and points of interest. The OMR software is a designed for the purpose of scanning and processing a large number of data from tests, surveys, assessments, and other types of forms and documents. This software is installed in the Optical Mark Recognition scanner or simply the OMR scanner that scans the form or document in order to initiate the data collection procedure. The final OMR software reports are basically the results obtained after the completion of the scanning process. This software has the potential to process large volumes of raw data and convert them into meaningful results. One of the biggest uses of this software is the scanning of test answer sheet. 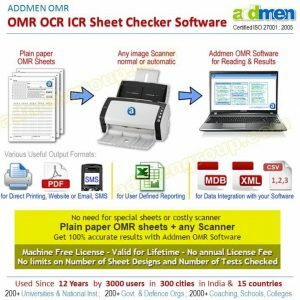 OMR answer sheet checker software is programmed in such fashion that it can scan and check a large number of OMR sheets without consuming a great amount of time. It greatly reduces the amount of labor and time that would otherwise be spent in the checking of such answer sheets. Because of the effectiveness and simplicity of the procedure, a majority of universities and educational institutions are now using this facility while conducting various types of tests and examinations. Most OMR software are capable of delivering outputs in various formats like PDF, Access, XML, CSV, DBF, etc. Nevertheless, different educational organizations have different rules and needs and therefore the program is made flexible enough such that changes can be made as per various types of requirements. The software also comes preloaded with a wide range of output and report formats especially the ones that are generally used by colleges and universities. The OMR software is quite flexible and it can work with the traditional OMR scanners easily. The scanner supported by the software can process a large amount of data and produce results in a precise and accurate fashion. It can detect even the minor anomalies in the answer sheet and thus produce clear-cut results. Once the answer sheets are scanned and the OMR software reports are formed, the software can automatically save the reports. The reports can then be used for various purposes and can even be shared virtually via email or can be printed out as hardcopies. It is a complex task to control the variety of activities of any school and doing it manually is surely a time consuming one. The activities of school, college or any university include various departments and it is very imperative to correctly handle all of it at the same time. It requires time, energy and appropriate arrangement for the smooth working of each unit as it is lastly based on the whole management of school, college or university. Handling & maintaining the reports of all students and staff without any software technology is a painful and tedious task. So, in this case there are Software technologies offered by admen group which will show as well as assist you in managing the college administration work. 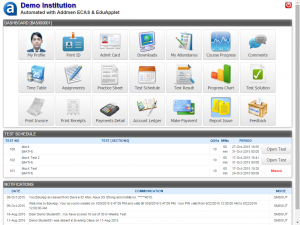 College Campus Automation Management Software will provide you the detail report of all your students and staff. Learning Management Software – One Step towards the Smart way of Learning. These days many educational institutes like schools, colleges, universities and coaching organizations are venturing towards the shrewd methods for learning through mechanized educational software. In this focused world where technology is utilized to upgrade each human experience, instructive establishments would prefer not to fall behind in developing new ways of learning. Enhanced Campus Automation Software is one such learning management software which utilizes most recent technology to encourage advanced methods for learning to create general aptitudes and capacities of students. Let’s see how Enhanced Campus Automation Software can be utilized as the best learning management software by instructive foundations. Most important advantage of this software is that you can manage the test administration. Tests can be characterized and made for a course through ECAS. Test span and its expiry period can be set for these tests. Test results and answer key can be seen by the candidate instantly after test if permitted by the manager. Graphical analysis reports and test analysis reports are accessible for better comprehension of student’s performance. Learning Management software also provides the candidate interface. So that students will be able to download the study material, test schedules, practice sheets and assignments for home work. Students can upload the solved test sheets by downloading the test sheets. Feedback questionnaires will be offered online for students to comprehend the performance of management from student’s point of view. Completed syllabus and pending topics can be observed course-wise, subject-wise, faculty wise, and so on through ECAS by staff as well as students online. Enhanced Campus Automation software has incorporated all these learning modules in one software and made it one of the most excellent learning management software.